In September 2015, Mi-Fone, the “first African Mobile Devices brand” challenged Xiaomi’s entry into the African market citing trademark infringement for the use of the Mi brand. Xiaomi plans to introduce the Red Mi and the Mi 4 smartphones in the African market. 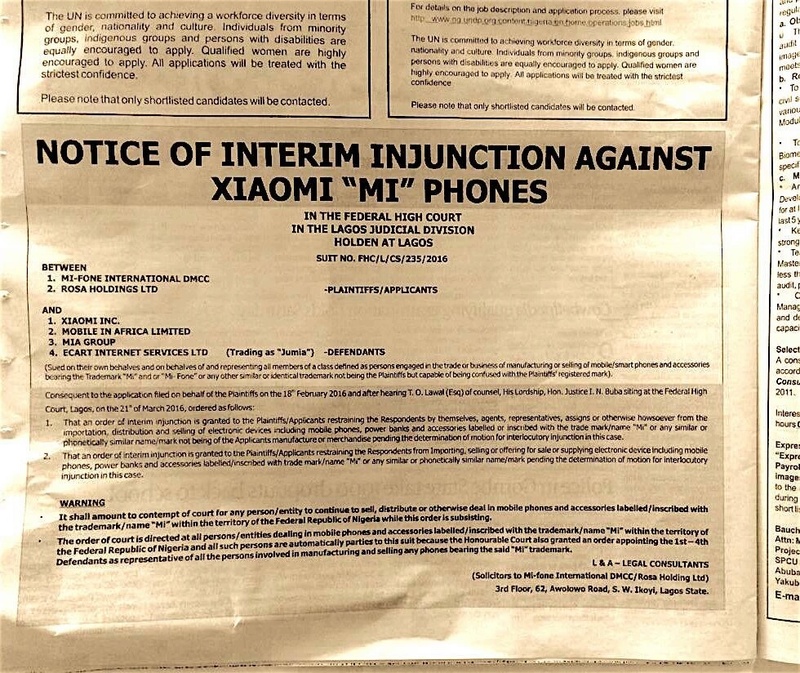 Mi-Fone issued legal letters to Xiaomi and its African distributors, Mobile Africa Limited, protesting plans to introduce “Mi”-branded products on the continent. Mi-Fone was recently acquired by an unnamed “public listed African company” and plans to solidify its presence in the 15 African countries it currently operates by unveiling new products in markets like Kenya and also expanding its operations to other African countries. Nigerian Tech publication Tech Cabal shared on its Radar forums that Mi-Fone got an interim injunction against Xiaomi phones. Also included were Mia Group and Ecart internet services that runs as Jumia in Nigeria. The injuction bars the sale, distribution and importation of devices and power banks with the Mi inscription or similar phonetics and has been filed in all African countries. Nigeria is the only country in Africa where the court has issued the court order. Mi-Fone launched in 2008 and its products range from mobile phones to portable chargers have been marketed and sold under the “Mi” brand. These include devices like the Mi 3000 which was touted as the first feature phone on the continent with 60 day battery life as well as the Mi-Obama.